An absolute must read for every man, woman and parent who wishes to see their children grow into healthy, well adjusted beings. Blurb: Despite popular belief, American boys tag behind girls in reading and writing ability, and they are less likely to go to college. Our young men are greatly at risk, yet the best-known studies and experts insist that it’s girls who are in need of our attention. The highly publicized “girl crisis” has led to many changes in American schools, politics, and parenting…but at what cost? 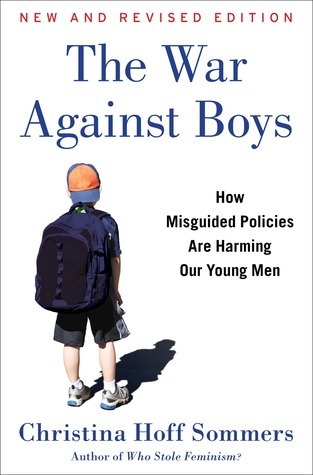 In this provocative book, Christina Hoff Sommers argues that our society has continued to overemphasize the troubles of girls while our boys suffer from the same self-esteem and academic problems. Boys need help, but not the sort of help they’ve been getting. About the author: Christina Hoff Sommers is a resident scholar at the American Enterprise institute in Washington, D.C. She has a PhD in philosophy from Brandeis University and was formerly a professor of philosophy at Clark University. Sommers has written for numerous publications and is the author of Who Stole Feminism? How Women Have Betrayed Women. She is married with two sons and lives in Chevy Chase, Maryland. I have been lamenting, of late, that men are being regularly emasculated in most radio and television ads to an extent that would not be tolerated if the same thing were happening to women. In fact, “Advertisers degrade men about 19 times more often than women, and usually to a higher degree,” says the National Coalition for Men. Given the insidious nature of advertising, and the fact that such ads are not only ubiquitous, but are also repeated hundreds of times a day, it amounts to a subtle form of social brainwashing. 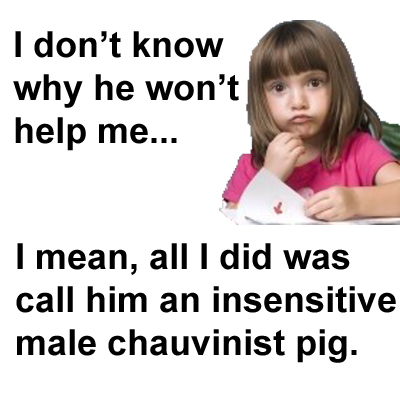 To some extent, and perhaps at a more insidious level, this ‘brainwashing’ is what Christina Hoff Sommers is getting at in her book The War Against Boys: How Misguided Feminism Is Harming Our Young Men [Simon & Schuster; Reissue edition, August 20, 2013]. In it, she addresses the very real problem of boys failing or dropping out of a school system that is, intentionally or unintentionally, biased toward girls. The rationale is often couched in terms of ‘equal opportunity,’ but as Sommers points out there is a marked difference between ‘feminist equality’ and ‘feminist gender’. There were around 100 of these fanatics, at the university before he spoke, ripping down posters, threatening and insulting anybody who tried to attend the lecture, and explaining as only heavily funded students can do, “You should be f—ing ashamed of yourself, you f—ing scum” to those with whom they disagreed. There is ample video evidence. ~ “Shrill backlash to men’s rights advocate,” December 8th, 2012. Specifically, Sommers points out (with statistical verification) that girls tend to receive more academic attention, and go on to higher education in greater numbers than boys—even if feminists claim the opposite. The squeaky wheel gets the oil, after all, and complacency doesn’t grab headlines. She also posits that boys are being feminized by discouraging traditionally masculine play, like physical competition and rough-housing, etc., for more feminine or unisex games. Moreover, this is being carried into the classroom by the choice of books like Jane Eyre, as apposed to more male oriented stories. Ergo, in terms of literacy, boys are being turned-off reading for lack of interest. As a possible solution, Sommers suggests that boys would do better in a segregated system with other boys. It is not a new idea, England has had exclusive boys’ school for centuries. Moreover, private schools—such as St. Andrews College in Aurora, Ontario (Est. 1899), and Upper Canada College in Toronto (Est. 1829)—have both operated along this line for over a century with outstanding results. Some people may feel intimidated by the title, i.e. the ‘war’* against boys, but to me it is quite appropriate. War has been declared, and is being waged against both boys and men, but it is only now that men are beginning to wake up to the fact. It is ironic, therefore, that it took a feminist—albeit an objective one—to sound the alarm. An absolute must read for every man, woman and parent who wishes to see their children grow into healthy, well adjusted beings. Five bees. *For those who still feel ‘war’ is too strong a term, see: “Men’s rights under fire,” ~ Toronto Sun Newspaper, February 7, 2014. It is a collection of little-known people, facts and events in Canadian history, and includes a bibliography of interesting Canadian books as well. Latest post: Norman Lee (1862 – 1939): The Klondike Cattle Drive.